As the last of the 2012 vintage Pinot Noirs are reviewed and attention turns to the 2013 vintage and even a few early releases from the 2014 vintage, the words “ultra premium” ring true from a range of producers. The wines are of such extraordinary excellence, that drawing distinct differences in quality between them in boils down to a bee’s nadget. 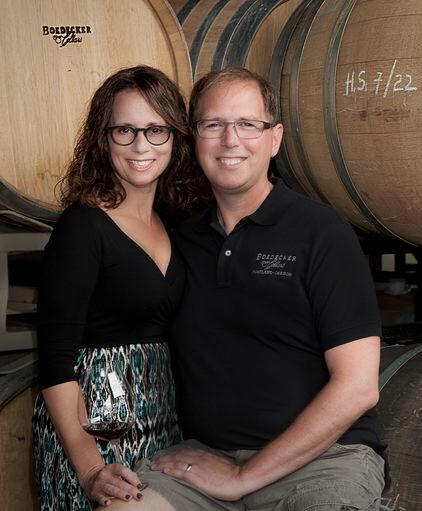 This is a unique husband and wife owned and operated artisan producer of Pinot Noir, Pinot Blanc, Pinot Gris and Chardonnay, founded in 2003, and based in urban Portland, Oregon. Both partners are Pacific Northwest natives and winemakers. Stewart Boedecker also is the enologist and vineyard lead, having begun his wine education at Cornell University, enriched his experience working in Northern California, and now has nearly two decades of experience crafting wines in Oregon’s Willamette Valley. Athena Pappas serves as cellar master and general manager along with her winemaking duties. The Pinot Noirs are crafted using traditional techniques involving small fermenters, indigenous yeasts, and extended barrel aging. The Winemakers Selection Pinot Noirs represent distinct blends that reflect each of their palates and are appropriately named Stewart and Athena. Boedecker Cellars was one of the featured wineries at the 2015 International Pinot Noir Celebration. A winery and tasting room is located at 2621 NW 30th Ave. in Portland and is open weekends. Visit www.boedeckerwines.com. This stellar winery has been featured in the PinotFile on a number of occasions. 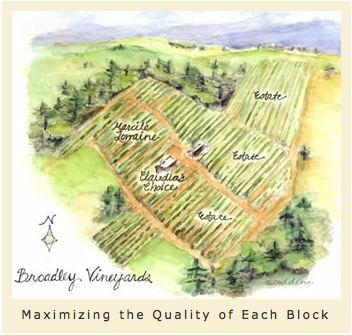 Family owned, Broadley Vineyards was established over 30 years in the hills west of the town of Monroe, Oregon, in the southern Willamette Valley. Craig and Claudia Broadley launched the winery in 1982, released their first wines in 1986, and had developed a reputation for outstanding estate Pinot Noir by 1994. Winemaker Morgan Broadley crafts the estate wines from 30 acres in the warmest and driest part of the Willamette Valley that include a diverse selection of Dijon clones as well as Pommard and Wädenswil. The wines uniquely feature partial whole cluster fermentation, significant fermentation in wood containers, and always are unfined and unfiltered. The winery’s tasting room is well worth a detour from the more highly publicized northern Willamette Valley wineries, and is open by appointment. Visit www.broadleyvineyards.com. 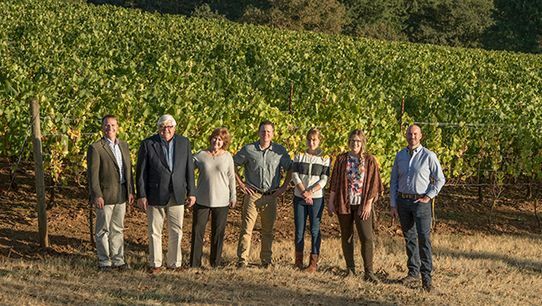 A French-inspired Willamette Valley winery dating to 1989 when Ken and Grace Evenstad, both Burgundy enthusiasts, invested in a 42-acre hilltop estate in the Dundee Hills of Oregon where Oregon Pinot Noir originated. They named the winery after their daughter, Serene. Their initial modest winery was located in Carlton and Ken Wright made their first wines dating to 1990. They later built one of the most modern and technologically advanced wineries in North American, completed in 2001. With additional property acquisitions, seven estate vineyards were planted over time to Pinot Noir and Chardonnay on the surrounding hillsides beginning in 1993 as part of The Evenstad Estate, the Winery Hill Estate Vineyard and Two Barns Vineyard were added in 2000, and additional vineyards were developed in the Eola-Amity Hills (Jerusalem Hill Vineyard, 2000) and Yamhill-Carlton (Abbey Oaks Vineyard, 2012) appellations creating a spectacular estate of 251 acres of estate vineyards on 715 acres. The vineyards are dry-farmed and sustainably managed under the direction of Results Partners Vineyard Management. The current head of the winemaking team (pictured below along with the Evenstads) is Erik Kramer, formerly of Adelsheim Vineyard. 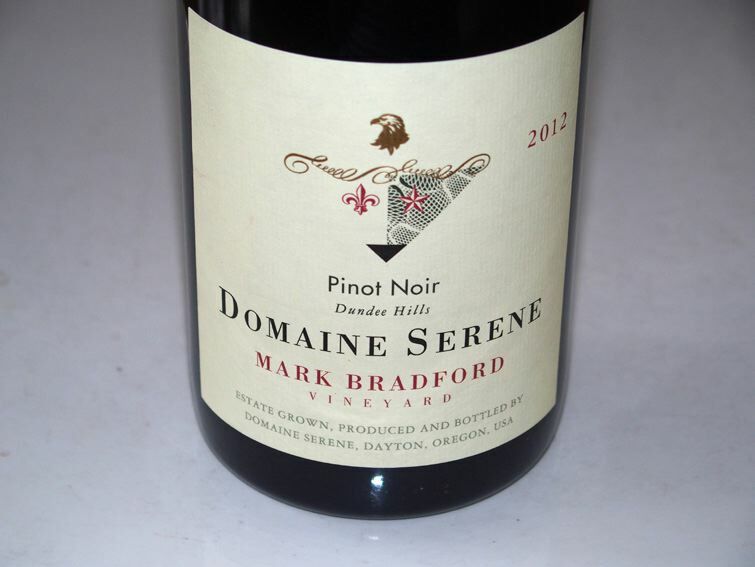 Several Pinot Noirs are produced, including the Willamette Valley blends from three Willamette Valley AVAs, Evenstad Reserve and Yamhill Cuvée, vineyard-designates, and ultra premium cuvées. The Dundee Hills Chardonnays (reviewed later in this issue) consist of both blends and single vineyard bottlings. A unique white Pinot Noir (Coeur Blanc) and Rosé (“r” - a blend of Pinot Noir and Chardonnay), a proprietary red blend (Grand Cheval) and a single Syrah (Rockblock SoNo) are also offered. 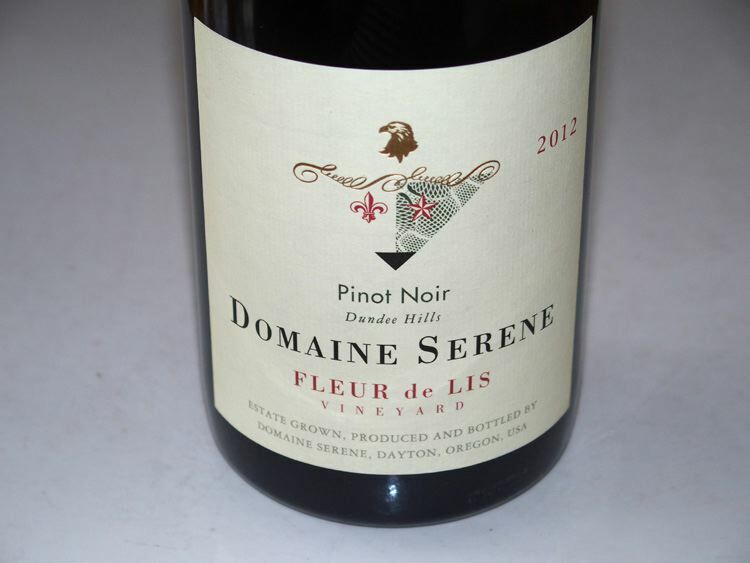 The accolades for the wines of Domaine Serene are unprecedented among Oregon producers. In April 2015, the Evenstads bought Château de la Crée, a Burgundy wine estate in the Côte d’Or. They will be making their own wines from famous vineyards including ones in Chassagne-Montrachet, Puligny-Montrachet and Volnay. The winery’s Tasting Room is open daily with tours of the 5-level winery building available by appointment. Three types of tastings are offered ($20 to $60) with details available on the winery’s website at www.domaineserene.com. A new wine tasting experience will open in 2017 in the Domaine Serene Clubhouse. (pictured below). Several wine club memberships extend exclusive offerings and experiences. A very reliable producer of superb Yamhill-Carlton estate Pinot Noir had success with the challenging 2013 vintage. Owner and winemaker Steve Lutz (along with David O’Reilly of Owen Roe), told me he picked before the major rain in September. The wines were difficult to evaluate in barrel, even the first six months after he bottled them, but are opening up and showing better and better as time goes by. He likens the 2013 vintage to the 2007 vintage as to weather and the way the wines tasted upon release, improving over time. 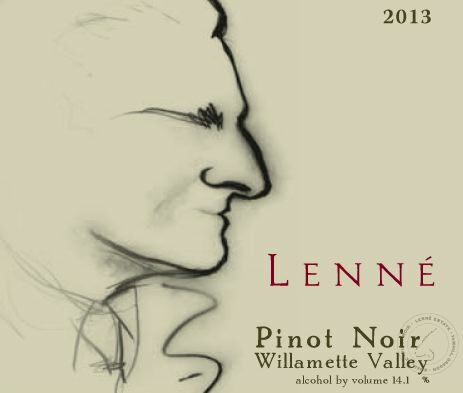 He said, “I love the 2013 wines for what they will become more than for what they are.” Lennè Estate Pinot Noir is produced from a 20.9-acre hillside vineyard. The tasting room on Laughlin Road is open weekends or by appointment. Visit www.lenneestate.com. My advice would be to cellar these wines for a few years (except the Le Nez) and they might surprise further. Otherwise, decant them. They are quite different from the powerfully fruited 2012 vintage wines but may have more appeal for those preferring more elegant, crunchy fruited, vibrant and savory Pinot Noir.